Carrie Ann Lucas, center, and her adopted daughter, Adrianne, 13, watch her adopted son Anthony, 11, get himself ready, at their home in Windsor. Carrie Ann Lucas uses a power wheelchair and is reliant on a ventilator. She is a single mother of four adopted children, all of whom also have disabilities, and she says because of disability bias, she has been investigated several times. A Kansas City, Mo., couple had their daughter taken into custody by the state two days after her birth because both parents were blind. A Chicago mother, because she is quadriplegic, endured an 18-month legal battle to keep custody of her young son. A California woman paid an advance fee to an adoption agency, then was told she might be unfit to adopt because she has cerebral palsy. Such cases are found nationwide, according to a new report by the National Council on Disability, an independent federal agency. The 445-page document is viewed by the disability-rights community as by far the most comprehensive ever on the topic  simultaneously an encyclopedic accounting of the status quo and an emotional plea for change. The U.S. legal system is not adequately protecting the rights of parents with disabilities, the report says, citing child-welfare laws in most states allowing courts to determine that a parent is unfit on the basis of a disability. Terminating parental rights on such grounds clearly violates the intent of the 1990 Americans with Disabilities Act, the report contends. Child-welfare experts, responding to the report, said they shared its goals of expanding supports for disabled parents and striving to keep their families together. But they said removals of children from their parents  notably in cases of significant intellectual disabilities  are sometimes necessary, even if wrenching. At the end of the day, the childs interest in having permanence and stability has to be the priority over the interests of their parents, said Judith Schagrin, a veteran child-welfare administrator in Maryland. In the bulk of difficult cases, ensuring vital support for disabled parents may be all thats needed to eliminate risks or lessen problems, many advocates say. The new report, called Rocking the Cradle: Ensuring the Rights of Parents with Disabilities and Their Children, estimates that 6.1 million U.S. children have disabled parents. It says these parents are more at risk than other parents of losing custody of their children, including removal rates as high as 80 percent for parents with psychiatric or intellectual disabilities. A Windsor woman with disabilities says the prejudice she encountered prompted her to go to law school, to better defend her own rights and those of other disabled parents. Carrie Ann Lucas uses a power wheelchair and is reliant on a ventilator because of a form of muscular dystrophy. She is a single mother of four adopted children, all of whom also have disabilities, including two who use wheelchairs and three with intellectual disabilities. Lucas says shes been the subject of several investigations by child-welfare officials that she attributed to bias linked to her disabilities. We are nearly 13 years later, and Heather is still doing very well, Lucas wrote. As a lawyer, Lucas has represented many other parents with disabilities. The lead author of the new report, disability-rights lawyer Robyn Powell, says her goal was to challenge presumptions that disabled people cant be effective parents. Ella Callow, a lawyer with the National Center for Parents with Disabilities and their Families, said the report raises fundamental questions about Americas social priorities  given that state and federal laws value both the well-being of children and the rights of disabled people. The ultimate goal, she said, would be to promote both values by expanding support for disabled parents. Callow, who is based in Berkeley, Calif., said child-welfare agencies need to provide more funding and specialized training with the aim of improving services for disabled parents. Schagrin, the Maryland child-welfare official, said she found parts of the report troubling because they seemed to suggest children were sometimes removed from their families only on account of parental disabilities. She said one recourse is to find members of the extended family  or other types of support  to help a parent with psychiatric or intellectual disabilities care for a child. But she said this approach could be taken too far, for example, if a mother with intellectual disabilities was placed in a group home with other disabled parents. Under current practices, Bartolo said, an expert assessment of a childs home life and the possible provision of services to the disabled parents might occur only after the child has been removed and the damage has been done. Going forward, she hopes child-welfare agencies will try harder to provide support before a problem worsens, potentially reducing the need for foster-care placements. The report praises a few states  including Idaho, Kansas and California  for modifying child-custody laws to the benefit of disabled parents. It urges Congress to amend the Americans with Disabilities Act to add protections for parents, and it calls on state lawmakers to eliminate disability as a distinct ground for terminating parental rights. Christine Waters, an attorney with Legal Services of Central New York, based in Syracuse, worked with colleagues in 2008-09 in a bid to change the state law specifying that parental rights can be terminated if a parent has psychiatric problems or is intellectually impaired. Some legislators expressed support, Waters said, but the effort ultimately failed. Everything would look like it was going fine ... and then there would be some well-publicized, awful incident where someone who had a mental illness  without support  did something shocking and horrible, and a child was seriously harmed or died and wed be back to square one, Waters said. Waters said some child-welfare officials resisted any change, wary of being held responsible if something went wrong. Disabled parents whose parenting ability comes into question often are placed at a disadvantage by parenting assessments that are inappropriate or unfair, the report says. It calls for better research to improve assessment standards and gain more knowledge about how various disabilities affect the ability to be an effective parent. One topic worth further study, it said, is parentification  the phenomenon in which children of disabled parents take on various care-giving responsibilities, even at a young age. 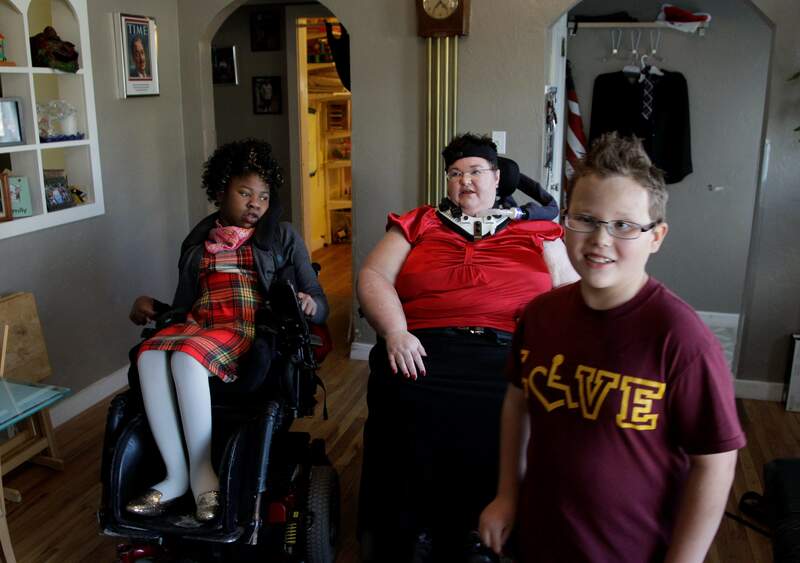 In Arlington Heights, Ill., Jenn Thomas, a 36-year-old mother who has cerebral palsy, says her 8-year-old twins occasionally complain about having to do a few extra chores around the house to help her. Her daughter, Abigail, nods and smiles upon hearing this, but says for the most part, their lives are kind of normal. For her, having a mother with a disability is just how it is, she says, shrugging. Sometimes, they ride on the chair with her  especially son Noah because he, like his father, D.J., is a little person, the term used by the family and others for someone genetically predisposed to having unusually short stature. When activities are farther away, the couple has created a support network to help when D.J. is working. He drives, but Jenn does not. I want them to enjoy activities and not be limited because I am limited, she says. So she coordinates with neighbors to help get the kids to swimming, cello lessons or basketball practice. Or she arranges for paratransit, a bus service for riders with disabilities and their families. Friends also helped redesign their kitchen to make it more accessible. The new report stresses that improved networks of support for disabled parents  encompassing transportation, housing, health care and outside intervention when appropriate  should be welcomed, and not viewed as evidence that the parents on their own are incapable. When children do face removal from their disabled parents, those parents may encounter barriers to meaningful participation in their legal cases, the report says. For example, financially struggling parents may have to rely on a court-appointed attorney with no special knowledge about the effects of disability. Kaney ONeill of Des Plaines, Ill., a quadriplegic Navy veteran, endured an 18-month legal battle to keep custody of her young son. Her ex-boyfriend filed for custody in 2009, when the boy was 10 weeks old, alleging that ONeill was not a fit and proper person to care for the child because of her disability. Refuting the allegation, with legal help from Ella Callow, Kaney demonstrated how she had prepared for motherhood by working with an occupational therapy program, adapting her house, securing specialized baby-care equipment and using personal assistants to help her as needed. She says her son, who taught himself to climb up his mother's wheelchair into her lap, is now going to preschool twice a week and is thriving. If you are a parent with a disability, you dont have a role model  you have to figure out how youre going to be a mother and overcome challenges, she said. For disabled women who either cannot bear children or choose not to, the possible option of adoption often can be complicated. Some foreign countries, notably China, rule out disabled people as potential adoptive parents. Elizabeth Pazdral of Davis, Calif., who wears a brace and uses crutches to walk because of cerebral palsy, said she encountered discrimination several years ago when she and her husband sought to adopt a child. She said one local adoption agency billed her an advance fee of $3,400, then advised that there were serious reservations about her ability to be a parent. I think it was dishonest to take my money and then tell me they were worried, said the 4-foot-tall Pazdral, 42, who is executive director of the California State Independent Living Council. Initially distraught, Pazdral obtained legal help, paid for an occupational therapist to come to her house to assess her capabilities and researched how other parents with disabilities had succeeded in raising children. The efforts paid off: The adoption agency dropped its objections, and in May 2008, Pazdral and her husband, a Stanford University physicist, adopted a baby girl named Madeleine. It was a huge life change  but thats true for any new parent, Pazdral said, recounting sleep-deprived nights, higher levels of chronic pain and the challenge of maintaining ones energy level.